One of the fastest ways to attract new customers is through paid advertising. 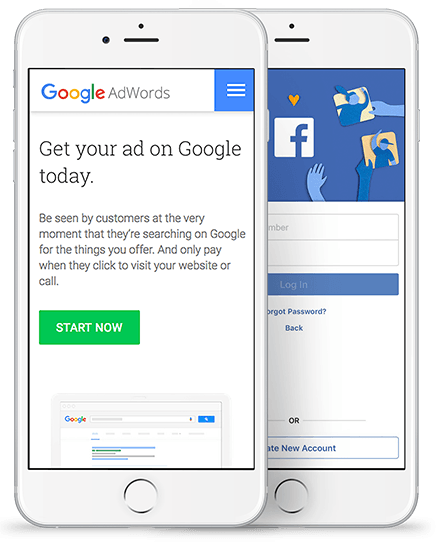 Through Google AdWords, Facebook Ads and other advertising platforms, we will help your business target new customers immediately. Paid advertising will get you instant results. It is a highly effective tool for increasing online exposure and driving more traffic to your website. If you need a consistent flow of traffic to your website immediately, paid advertising could be your answer. An effective Google AdWords campaign can be used to target and engage new customers. A comprehensive online marketing strategy will use a combination of both organic and paid search results to get the best results. Get new customers with Facebook Ads. Facebook Ads are an extremely cost-effective way to reach potential customers. We can run a campaign to target a specific market and compel them to visit your website, make an online enquiry or call your phone. Banner ads are useful in directing potential customers to your website using impressive images or text. We can design banner ads that reinforce your brand and attract more customers. Remarketing targets people who have already had an interest in your business. This technology can be used to engage these customers and bring them back to your website where they will be led to follow strong calls-to-action. We take a holistic approach.